Diamond Kite: 46" * 97"
High quality fabric with a premium flat winder and durable 50-meter string, well-built frame. It's one of the best toys for outdoor games and activities. ✪ Best Gifts For Kids: comes with large Delta and Diamond Kites, suitable both for boys and girls over 3 years old and adults. Buy one now, these uniquely patterned kites will never let you down! 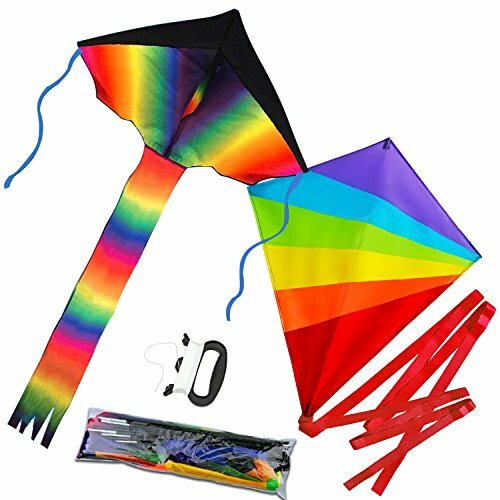 ✪ Premium Kite Kit Set: The kites are made of durable nylon fabric and flexible fiberglass rods; 2 different pattern design, bright color and stylish appearance will be more attractive to others. ✪ Portable: Comes complete with kite line on a handle winder and a reusable kite bag, it can be easily folded into the bag or most suitcases, easy to assemble and simple to launch. ✪ Enjoy Your Time for Flying: Take a vocation on the beach with your family spending a pleasant and meaningful holiday, leaving some precious memories! ✪ 100% RISK FREE or Money Back Guarantee - Product comes with 12 months Warranty. Please feel free to contact us for replacement or refunds if there is any issue with your purchase. If you have any questions about this product by Tintec, contact us by completing and submitting the form below. If you are looking for a specif part number, please include it with your message.